If you have been reading Sweet Potato Bites for a while now, you know that I love peanut butter, especially the Dark Chocolate Dreams flavor from Peanut Butter and Co. 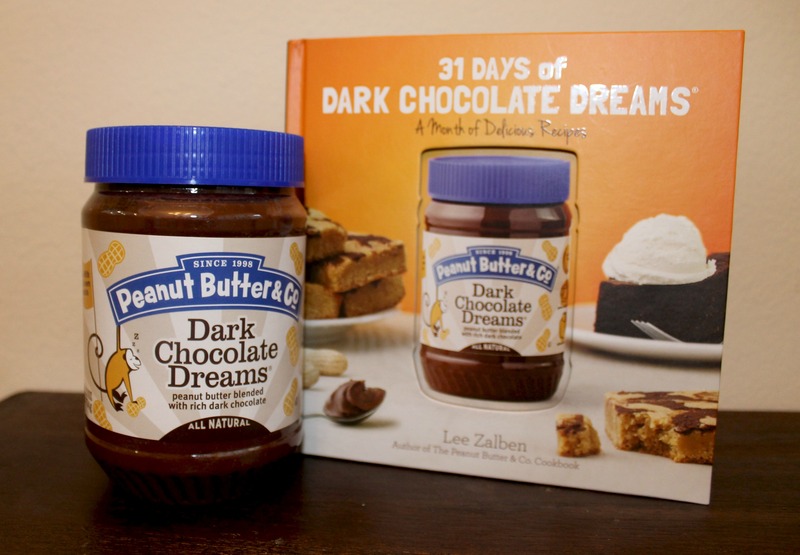 So when I received the 31 Days of Dark Chocolate Dreams Cookbook along with a 28oz jar from the Peanut Butter and Co. team, to say I was excited is an understatement. 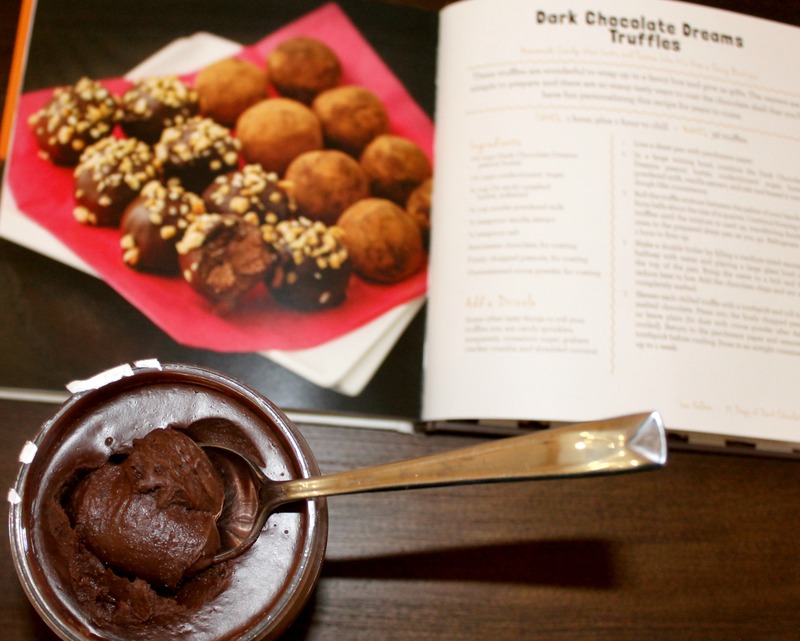 I immediately opened the book and decided to make some Dark Chocolate Dreams Truffles. I’ve been meaning to make chocolate truffles for some time now, and what better way than with some delicious dark chocolate peanut butter? The recipe in the 31 Days of Dark Chocolate Dreams cookbook is ridiculously easy, and this is the perfect treat to make for a crowd. I made these for Super Bowl Sunday, and they were gobbled up in minutes. The only modification I did to the recipe is swap the butter for coconut oil, and they still came out delicious! 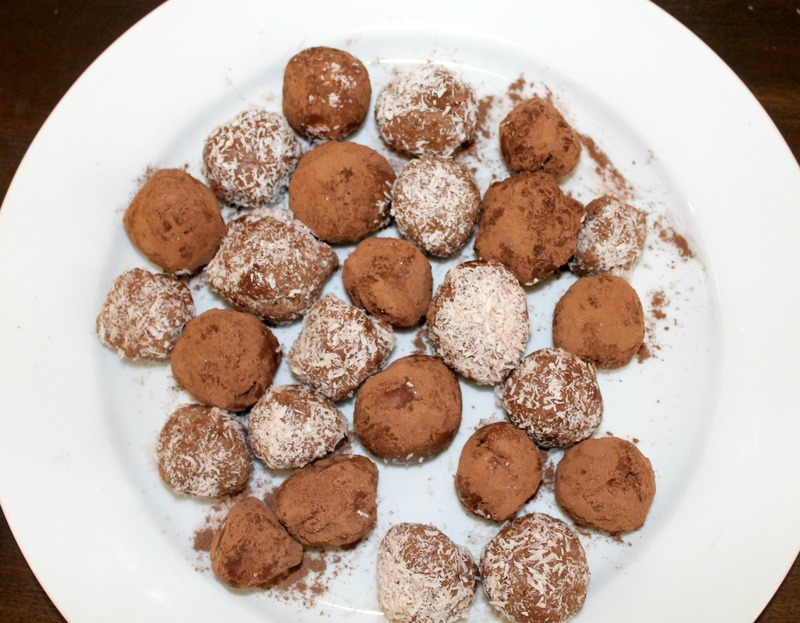 The best part about making truffles is that you can coat them however you want: sprinkles, cocoa powder, coconut, etc. The possibilities are endless! Line a baking sheet with parchment paper. In a large mixing bowl combine all your ingredients and mix until you create a peanut butter dough. Roll your dough into small balls and place on the parchment paper. Place your baking tray in the fridge and let the balls firm up for an hour. To create a chocolate coating, melt your semi-sweet chocolate in the microwave or in a double boiler. 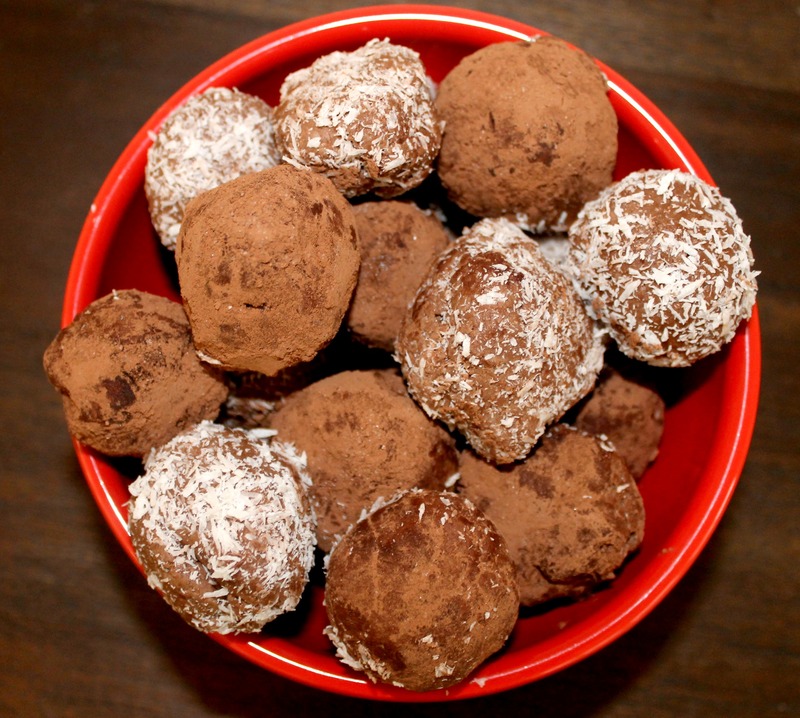 Roll your chilled truffles in the chocolate and add your chopped nuts or coconut. If you don’t want to do a chocolate shell you can just roll your truffles in some cocoa powder. I personally chose to do cocoa truffles and coconut truffles. So how would you like to win your own copy of 31 Days of Dark Chocolate Dreams AND a 28 oz jar of Dark Chocolate Dreams Peanut Butter? Now’s your chance! Simply leave a comment below sharing your favorite peanut butter recipe! You can earn extra entries by following @socaliallie on twitter and instagram, liking Sweet Potato Bites on Facebook and tweeting about the giveaway! Entry open to US Residents only. Giveaway ends on Monday, February 10th at 8am PT. Good Luck! This entry was posted in Best Of, Giveaway, Gluten-Free, Good Eats and tagged chocolate, peanut butter on February 3, 2014 by allie@sweetpotatobites. Ahhh those look so good! I still can’t decide what to make! I make dessert for Sunday Dinner every week, and this is by far the most requested. Peanut Butter Swirl Brownies. Oh wow! That recipe looks amazing – definitely bookmarking! I’m going to go with peanut sauce! What a fun recipe though, I wish I had one of these for dessert right now! For dessert its the easiest of all recipes…3 ingrediant peanut butter cookies. I cup peanut butter, 1 cup sugar and 1 egg. Cook around 8-10 minutes on 350 and yum yum. Especially good with the white chocolate peanut butter! I always love a good peanut satay sauce with chicken too…delicious! I love to make Peanut Butter Banana Bread. Just make your own special Banana Bread recipe, but mix in a cup of Peanut Butter into the batter before pouring into the bread pan. I like to use Crunchy Peanut Butter in mine. When I saw your blog and this giveaway, I knew it was meant to be! My favorite peanut butter recipe is using PB & Co’s cinnamon raisin swirl in a baked sweet potato with cinnamon and honey 🙂 those truffles look delicious!! I love making chocolate banana peanut butter smoothies. I love peanut butter coffee cake! I love peanut butter fudge! peanut butter, fish sauce, sugar, crushed garlic – a perfect dip for spring rolls. I love chocolate protein peanut butter smoothies blended with a frozen banana! Perfect refreshing cool treat! I keep it simple – grilled peanut butter and banana sandwiches – it’s my treat lunch every Saturday!! I make great peanut butter cookies, and peanut butter bread… would be great to try it with the dark chocolate dreams! I like to make peanut butter fudge! Looking forward to reading about more PB recipes!